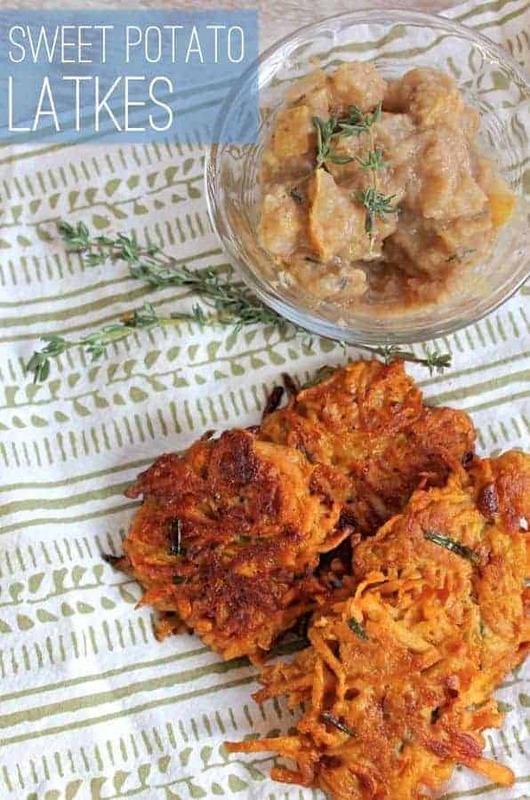 Have you ever had a latke? Shortly after Mark and I got married, I remember his mom coming to visit and showing me how to make Jewish classics like latkes, kugel and brisket. I had never heard of latkes (seriously) much less eaten one! Turns out they are total fried potato goodness. Now I make them with sweet potatoes. Yes, they are still fried but now I can tell myself they are healthy, right? The real best part of latkes? The sides! 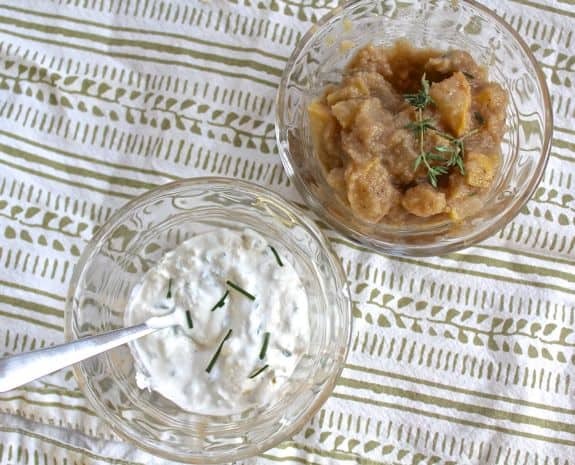 Sweet applesauce and cool sour cream …yum. It’s funny that Hanukkah has become one of my favorite holidays. The kids love our little traditions – lighting the candles each night, opening their small gifts, eating a chocolate gelt coin. Having 8 nights to celebrate lets you slow down and enjoy it. I’m always sad that Christmas morning is over so fast, aren’t you? If you are celebrating this weekend, Happy Hanukkah! 1. Grate potatoes through the large holes of a box grater. Stir together potatoes and flour. Stir in eggs, green onions and salt. Pour oil to depth of 1/2 inch into a large heavy skillet, heat to 350. Shape a generous tablespoon of sweet potato mixture into a patty and fry in batches, 2-3 minutes on each side. Drain on paper towels. Makes about 2 dozen, and you definitely want to eat these immediately while they are still warm and crunchy. Stir together ingredients in a small bowl. Cover and chill at least 30 minutes. Stir together all ingredients in a saucepan. Bring to a boil over medium-high heat. 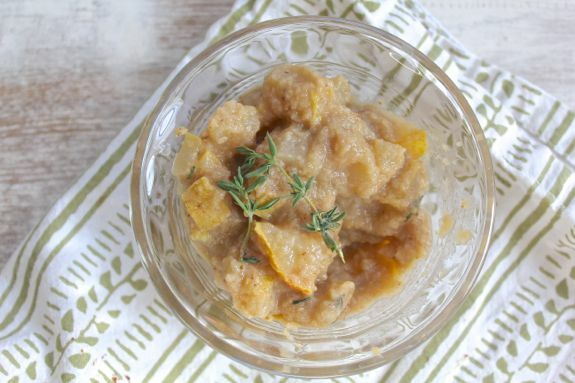 Reduce heat to low and simmer for 5-7 minutes until pear is tender. A chunky applesauce is recommended but I used my regular applesauce and it was fine. I also omitted the ginger because I didn’t have any on hand and we still wolfed it down. Not to elect myself Chief of Vegan Police or anything, but this recipe really isn’t appropriate for http://www.findingvegan.com since it is full of animal products (eggs, butter & sour cream) and isn’t vegan. If you’re planning to post more recipes on Finding Vegan, you might want to double check your ingredient list first. Thanks! No, you are totally right! I didn’t realize that it had been submitted there (someone helps me with that) so I’ll see if I can take it down. Thanks for letting me know! OH this looks great! We’re all about sweet potatoes around here and I know my family would love these. This sounds good – I’m gonna have to try!! Oh my goodness these sound good. Yes they’re totally healthy (maybe if we all say that they will be?)! Thank you for the post. I love that kind of food and I shared on facebook, twitter, I also pinned it. I never had latkes until I celebrated Hanukkah with my husbands family either. But I they are a favorite on mine too – especially with sour cream! Major yum! :) Cannot wait to try these out this weekend. I can almost taste the crunchy potatoes in your photos! 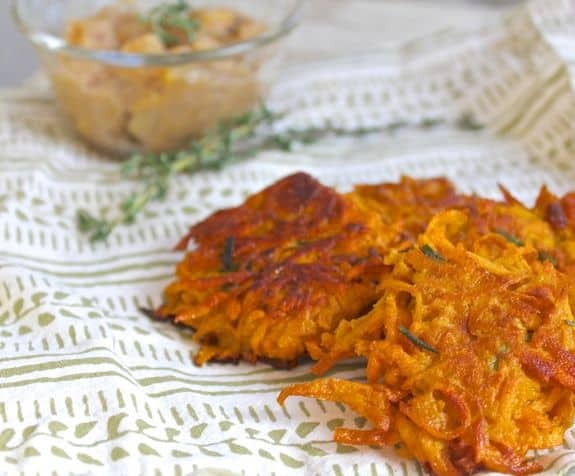 Those look yummy, especially the sweet potato latkes!